I know that floor paint has been used for decades to mark the floors of industrial workplaces, however, just because something has been around or done for a long time does not mean it is the best practice or choice today. There are many cons to using floor marking paint that have just been accepted as part of the process to marking floors. These drawbacks include intense smelly fumes, long dry and cure times, and losses in production due to areas being roped off during drying periods. Not only are these aspects associated with paint cumbersome, but they are simply unacceptable in today’s society of creating well-functioning, efficient workplaces. There are many benefits to using floor marking tape. For instance, floor marking tape, unlike paint is easy to apply, can be utilized at any time, and retains its strong colorfast marking properties despite constant wear and tear. No extra equipment needed: When installing floor tape, all you truly need is just the roll of tape. It is really that simple. While on the other hand, floor paint requires variety of extra tools such as paint rollers, brushes, and sprayers just to do the job. Then the clean-up associated with paint is a whole additional job in itself as paint specific cleaners and solvents need to be used to clean paint tools and equipment. No Wait Time: Have you ever heard the expression, “It’s like watching paint dry?” if you have, you know that paint can take a long time to dry and can be quite boring to boot. However, floor tape requires no dry time and taped areas can be utilized immediately after they are marked. 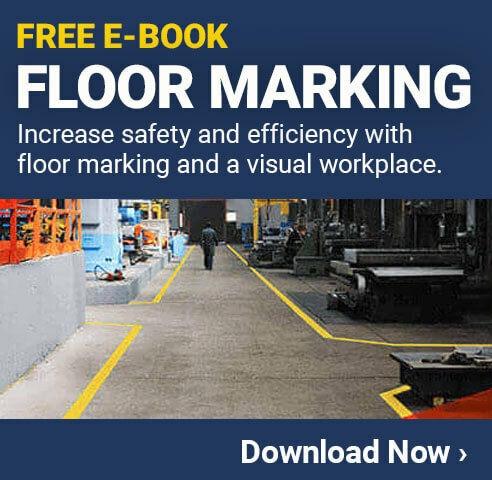 In other words, floor marking tape involves no loss in production time. Extreme Levels of Durability: Floor tape can provide top levels of durability that can easily outlast that of paint. Floor tape features enhanced protection against forklift traffic, chemical spills, trucks, pallet jacks, etc. Don’t trust the marking of your floors to just any old paint or tape product on the market. Instead, take time to get educated about which products can provide the service and quality that you are truly looking for. When it comes to floor marking tape, SafetyTac Floor Tape is one of the leading floor marking tapes out on the market. This industrial strength tape has proven itself time and time again to its users and has the ability to outlast nearly any other floor tape available.